A while back, I bought this 50-movie set, Sci-fi Invasion for five bucks. That adds to up to cents per movie. 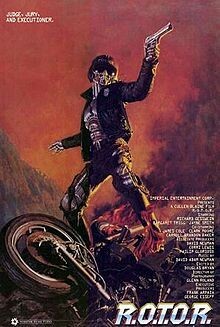 Today it’s a trip back to 1989 for the Terminator/Robocop ripoff, R.O.T.O.R. Here’s what happens: Heroic police captain Barrett Coldyron (sweet name!) 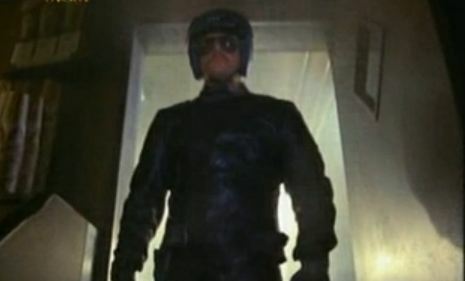 is developing a new robotic police officer to clean up crime on the mean streets of Dallas. He wants four years on the project, but the scumbag politicians give him only 60 days, so he quits. 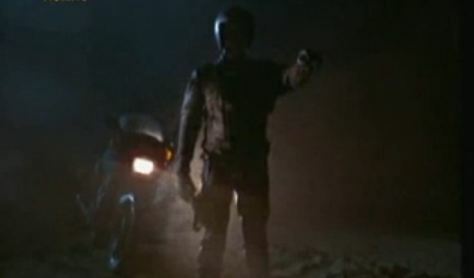 Without him, the project goes haywire, and the mustachioed cybernetic cop R.O.T.O.R. is out on the street. Speculative spectacle: Because he’s still just a prototype, poor R.O.T.O.R. doesn’t quite get the whole “serve and protect” thing, executing people for minor crimes. Now, Coldyron has to take down his own creation. What the Felgercarb? 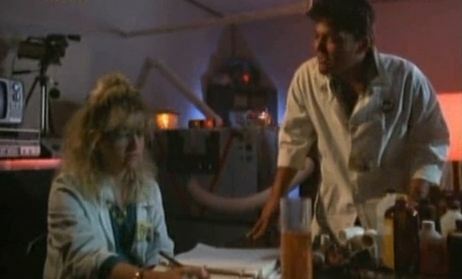 Coldyron enlists help from Dr. Steele, a female scientist/bodybuilder with a huge white streak in her hair. I’m very tired. Trivia time: R.O.T.O.R. stands for “Robotic Officer Tactical Operation Research.” Because “research” is something what we want to see in an action movie. Worth ten cents? This movie is filled with whacked-out dialogue, so much so that it has me wondering whether it’s an intentional comedy. It’s right on the line. Unfortunately, it also suffers from long stretches of absolutely nothing happening (there’s a driving montage every single time any character drives from place to place). So spend your dime on other stuff.